You can listen to 'Teenage' here. Another musical gem entered my life somewhere in the middle of last week. High on a fever this music entered my brain and made sparks go off all over. Luckily for me the music has the same effects in my normal state of body and mind. Waiting for something to happen is so beautiful, that it nearly makes me quiet. Sometimes it is enough to be quiet in the face of beauty. Not so when writing a review though. 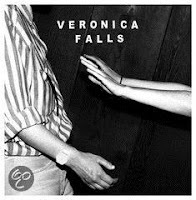 Veronica Falls makes pure pop in Waiting for something to happen. Some songs faster, some slower. 'Daniel' comes so close to The Velvet Underground, the lead guitar recreates the sound nearly perfect, that I can imagine Moe Tucker singing it. She isn't though. The light, high and very pleasant voice of Roxanne Clifford mixes the whole album long with the voice of James Hoare. She has this same form of longing in her voice that Laura-May Carter of Blood Red Shoes can put into her voice. They both play guitar. In the back ground you can also hear drummer Patrick Doyle singing. On bass we hear Marion Herbain. Together they are Veronica Falls, from London in the UK. The music on Waiting for something to happen bounces in all directions. It is exuberant in a shoegaze kind of way, full of adventure and pleasure. It spells inventiveness in the form of added melodies by guitar and/or voices. In every nook and cranny of the song there's another voice to find or something fun by an extra guitar. But most of all Veronica Falls delivers songs in a form of pop that comes with a huge P. It reminds me of a million things. As I already mentioned The Velvet Underground, there's some The Cure in there, the pop feel of The Hollies, Fountains of Wayne and The Mamas and the Papas, but what I notice most in the singing is the influence of Veruca Salt from its top album 'Eight arms to hold you' from 1997. The duo behind Veruca Salt attested at the time to the fact how hard producer Bob Rock pushed them on melody. Something like that must have happened on this album with producer Rory Attwell also. Veronica Falls can be labelled with several recent bands that look back at the psychedelic era of the sixties and reproduces a part of this music in their own way. The History of Apple Pie, Jacco Gardner, Foxygen, Christopher Owens, Seapony, all had a review over the past weeks on this blog. I definitely like Waiting for something to happen best of the acts mentioned. The first songs on the album simply blew me away hearing them for the first time. An experience that is quite rare, I can assure you. The music is propelled forward by drummer Patrick Doyle. He mainly uses the skins of his drums. The cymbals are only there for accents. This gives the songs a sense of urgency that is given accents by the rhythm guitars. Not seldom played in a The Cure way, that allows for a delayed form of hurry. Pace with notes left out, together creating a unique sound, that explains part of the attraction. The keen ear for melody and harmony and the attractive voice of Roxanne Clifford make for a perfect mix called Veronica Falls. Veronica Falls aims for the highest, the perfect pop song. The band succeeds several times on Waiting for something to happen. The band's second album, after the eponymous début of 2011, is a triumph on the verge of psychedelic, dreampop, shoegaze and pure pop. The up tempo trio of songs that opens the album is great, but nothing prepared me for the fantastic 'Shooting star' that is a lot slower and has so much more impact. The dissonant guitar that hoovers on the verge of being false. The slow, under cooled singing, it makes a beautiful song. Each time the album is over before I know it and it just makes me want to do one thing: turn it on again. If you only check out one album a year by a band that you haven't heard of before, you better make it this one. Absolute end of year album list material.